Unfortunately, in 1986, infighting among the Krewe/CAC leadership, combined with pressures from the City due to the parade occurring the night before the Super Bowl was to be played in New Orleans, caused the untimely demise of the Krewe of Clones. Not wishing to be denied a good time or any excuse for wild excess, two Clones sub-krewes -- the Krewe of Underwear and the Krewe of Mama Roux -- held a "Clone Funeral". An anatomically correct (and erect) clone was created and placed on a funeral cart, and a short march to a party site was planned. At the last minute, the individual most responsible for the entire problem got word of the plans, and called the police on the unauthorized march. Informed by New Orleans' finest that they could not march in the street, since that would block traffic, the costumed mourners marched on the sidewalk, while eleven police cars rolled along next to them, blocking the street far more effectively than the marchers ever could have. That same year, two other Clones sub-krewes, the Seeds of Decline and the Krewe of C.R.U.D.E., held their own informal march on Mardi Gras itself, in the French Quarter, with the theme of "The Stupor Bowl". After Carnival was over that year, the two groups got together, established an official parade date (three Saturdays before Mardi Gras, the old Clones date), and received permission to march in the French Quarter. 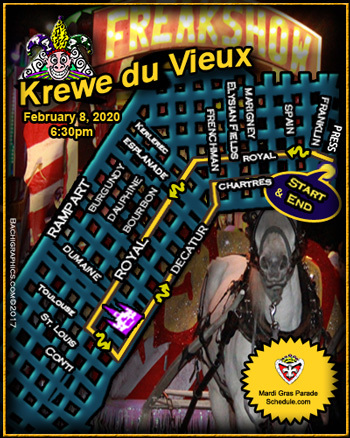 Thus was born the Krewe du Vieux Carre (the old, French name for the Quarter), now shortened to Krewe du Vieux. The first Captain of Krewe du Vieux was Underwear's own Craig "Spoons" Johnson. The following year, Susan Gibeault assisted Spoons as Co-Captain. In 1989, the third year of the parade, Ray "Plaine" Kern debuted as Captain, a post he would hold for ten years. Under Ray's watch the Krewe grew from about 150 drunks stumbling through the French Quarter in search of a bar, to become a relatively well-organized group of about 600 (most of them still drunk), with an actual parade route. Traditions such as the hand-made, hand- or mule-drawn floats and showcasing of the city's incredible brass bands became firmly established. The crowds watching the spectacle grew larger than Clones had experienced even in its heyday, and the annual Krewe du Vieux Doo, the ball after the parade, became one of the more storied parties of the year. For the 1999 parade, the Captain's mantle fell on Keith Twitchell, who formed a committee of volunteers, known as the official Krewe du Vieux CABAL (or in some people's minds, the dirty dozen). Having burned out Captain "Plaine", we decided to make him King that year! And, in 2002, Katherine Cargo took on the leadership role as Captain Inertia. Membership capped out at 900 in 2003, the Krewe's 17th year; but the crowds continue to grow, and care is taken to make sure that Krewe du Vieux remains faithful to its satirical, outrageous and inebriated roots. Bethany Ewald Bultman, Prevent Death by Lifestyle Editor, is a passionate culinary anthropologist; the former southern editor of House & Garden for 17 years; and in the far distant past, the food columnist for the now defunct local weekly, “Figaro”. Bethany is the author of five books and numerous articles who has traveled the world lecturing on culinary history and sampling the best foods the world has to offer. Theme: " Where the Vile Things Are "
Theme: "Krewe du Vieux Comes early!" Theme: "Krewe Du Vieux Celebrates Crimes Against Nature"
"Krewe du Vieux: 25 Years Wasted"
"WWKdVD? (What Would Krewe du Vieux Do?)" "The Idiots and the Oddities"
"Krewe du Vieux's Urban Myths"
"Krewe du Vieux Goes Deep"
"Krewe du Vieux Achieves Decade-ence"
"The Ballot of New Orleans"
"Krewe du Vieux Rights the News"
"Krewe du Vieux's Lost Conventions"
"Krewe du Vieux Smells Something Fishy"
"Krewe du Vieux Eats Out"